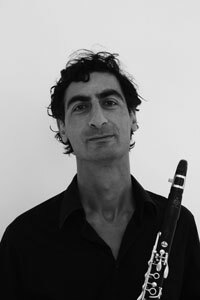 Nusret İspir, considered one of the most unique clarinetists of his generation won first prizes at important competitions such as the Europe Clarinet Competition and the International Clarinet competition in Dos Hermanas. Ispir has performed numerous concerts with artists such as Vlademir Askhenazy, J. C. Casadessus, Gennady Rozhdestvensky, J. Mercier, Frederic Aguessy, Dominique My, Alain Damiens and the Ysaye Quartet. Dedicated to contemporary music he has performed numerous world premiers from composers including Valery Arzoumanof, Philippe Boesman, Ertugrul Oguz Firat, Tugrul Pogun, Fusun Koksal, Orhun Orhon, Mehmet Can Ozer. In addition, he has performed in live broadcasts of the Radio France, TRT, Ukrayna, İspanya, Deutsche Welle, Deutsche Kultur . His CD "Siyah Kalem" (Black Pencil) that he collaborated with M.Can Özer and David Chevalier on the poems of Pavese has been recently released. Currently he is the solo clarinetist of Bilkent Symhphony Orchestra as well as a member of the Hezarfen Ensemble. He continues to perform concerts worldwide and gives masterclasses in countries such as Turkey, France, Israil, Ukraine, Tunisia, Germany and Spain.